2013? already, time flies! I have been a bad blogger or should I say non blogger. You know the drill, life gets busy blah blah blah. Last year I was stuck in regards to my blog, so I just let it be for a while, waiting for something to inspire me, to ignite my yearn to learn and push myself. Here it is. This lovely book was a birthday gift. 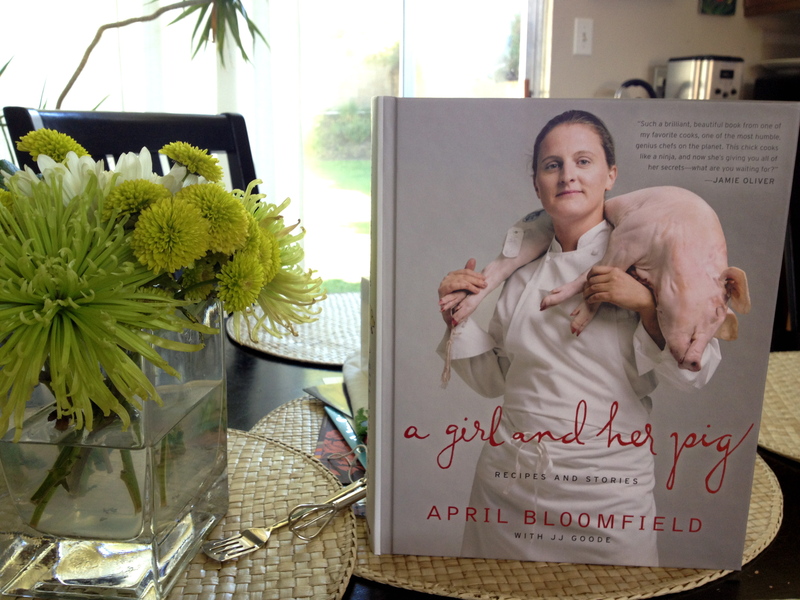 I’ve been following April Bloomfield’s career, loving her path to this book and the well deserved accolades that followed its launch. I imagine myself in my 20’s, moving to New York to beg for a job at one of her restaurants. Since my 20’s were forever ago and I already did that leave home thing, I’m going to blog her entire cookbook. I know… I know… sounds familiar? Tons of people have blogged entire cookbooks and then movies were made…not what I’m after. I want to do this for a few reasons. The structure of the project will push me to blog more often. There are several recipes in this book that will require me to cook items I’ve never worked with or tasted. Mostly I want to cook with April and learn from her. Here are the stats for this project. I hope to have guests join me in the fun, fellow chefs, foodie photogs, hungry people, brave eaters, and this goes without saying…….any and all dishwashers are always welcome. Bring on the Lambs Head! This entry was posted in blogging girl and her pig, Culinary School and tagged april bloomfield, blogging girl and her pig by Sarah. Bookmark the permalink. I can’t wait so excited for you. So, when we come over next month, you will treat us to one of those meals? We can’t wait. We go shopping together for the ingredients. Soooooouuuuuuuiiiieeee!!! You Go Girl, go Hog Wild! I’m feeling quite hungry, pleases advise me of your next post. Amazing Sarah! Looking forward to following the posts. I’m with Julie, Can’t wait to see you with a pig! Wonderful! So happy to hear about your new journey into the fascinating and exciting world of yummy food.